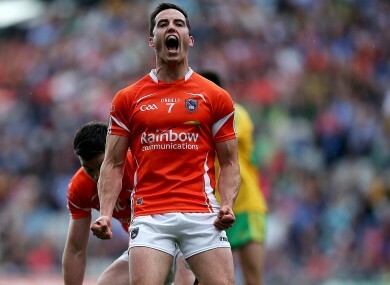 Aaron Kernan reacts as a free is awarded against him. IT’S FAIR TO say that TV3′s screening of The Toughest Trade sent Twitter into meltdown last night. A host of GAA stars were quick off the mark on social media after watching the exploits of Jackie Tyrrell, Aaron Kernan and David Bentley on the enthralling documentary. Kilkenny ace Tyrrell swapped his hurl for a baseball bat while ex-Armagh footballer Kernan enjoyed his sojourn with Premier League outfit Sunderland. And there was that cameo appearance from Bentley, the former Spurs star and England international, with All-Ireland club football specialists Crossmaglen Rangers. The show is now available to watch on the TV3 player, here. Well done to all in involved with the #TheToughestTrade.... great documentary. Surely a sequel to come @AIB_GAA @TV3Ireland. Email “Tyrrell, Kernan, Podge, Bubbles and more: Staggering reaction to #TheToughestTrade”. Feedback on “Tyrrell, Kernan, Podge, Bubbles and more: Staggering reaction to #TheToughestTrade”.